First, I want to welcome all the new subscribers to my blog. I hope you enjoy my occasional essays, and the notices of book releases a few times a year. Ginny Langemore, 13-year-old child of a troubled home, wakes late one night to see a man with kind eyes looking through her bedroom window. Her second-story bedroom window. But wait – he’s not looking through her window. He’s in her window. Inside the glass. Ellington “Ellie” Dardanelle, wrongly convicted of a crime, is not enjoying his first night in prison. Especially when his mountainous cellmate decides to have his way with him. But Ellie responds in a rather “eye-opening” way to the hulk’s unwelcome advances. Theodore Copeland, money launderer for organized crime. Theodore and Artie discover something in each other that goes far beyond their larcenous ways, though volatile Theo does his best to deny the attraction. Ginny names her late-night visitor the Kind Man, and sees him on infrequent occasions over the years. Ellie, Artie, and Theo all hear murmurings in their head from someone – or some thing – they come to call the Voice. “Rust” has lots of human drama to go along with the supernatural elements, and I do wish you happy reading! Click on the cover photo below, or click here to go to Amazon to read the sample chapters. Thanks so much for checking this out, and as always, thank you for reading. Sounds intriguing. Can’t wait for the finished product. 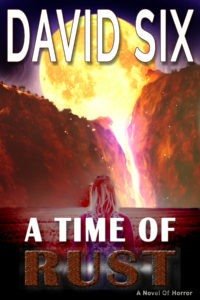 Awesome to see another novel, David. Just purchased it and looking forward to reading it. Will leave a review on Goodreads, Amazon and my blog when I am done. I also do promos on my blog, so if you wish me to do one for you for any upcoming novels, let me know. Would be pleased to promo your work. Thanks so much, Lori. Please let me know how you enjoyed “Rust”.